On the Mexican island of Cozumel, all we really wanted was a good meal. Not a bargain on a snorkeling excursion or a bespangled sombrero for $50 USD, or a cheap rental car. This is what Cozumel promises in abundance when you first arrive, before your feet even leave the ferry dock. In the most touristed of places, a tiny island full of salesman hawking their wares to cruise ship day-trippers, we weren’t sure we’d find it. We came to Cozumel, and its only major city, San Miguel de Cozumel, for the same reason that everyone comes—for the coral. Cozumel’s reefs are among the best in the world for diving and snorkeling, but what do you do—and eat—after you’ve peeled off your wet suit and drip-dried? We decided to eat. Working on a tip from a guide book, we searched for a specific taco joint away from the main drag, but never found it. We did find, however, a quieter Cozumel. It wasn’t as glitzy as the tourist-centric fare on Avendia Rafael E. Melgar. We didn’t find a Margaritaville or Senor Frog’s pumping loud pop music onto the sidewalk or selling t-shirts. But this was, of course, was the appeal. 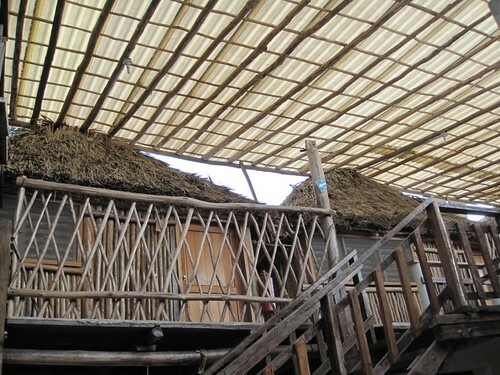 A five-minute walk inland and away from Avendia Melgar revealed low-key dive shops and tiny bars strung with lights. We also found La Cabana del Piolin, a restaurant so good that we went back two nights in a row. At first glance, it looked less like a restaurant than a room full of plastic chairs lit with bare bulbs. (We didn’t find the sign bearing the restaurant’s name—hand-scribbled and taped to a back wall—until the second night.) But then a waitress offered us a seat and appeared with plastic-laminated menus and a tray full of appetizers to go with our Dos Equis, all arranged on little paper plates, and simply and impeccably prepared. There were cucumbers with chile and lime, noodles in a green chile sauce, stewed squash and onions, a white fish with chopped tomatoes, sausage in a spicy red sauce, and of course, a mountain of homemade tortilla chips. Dinner was tacos—maybe the best we’ve ever had. The shrimp came in a light sauce of cooked tomatoes and onions, and was seasoned with nothing more than lime juice and salt, while the beef and pork were chile-rubbed and perfectly grilled. 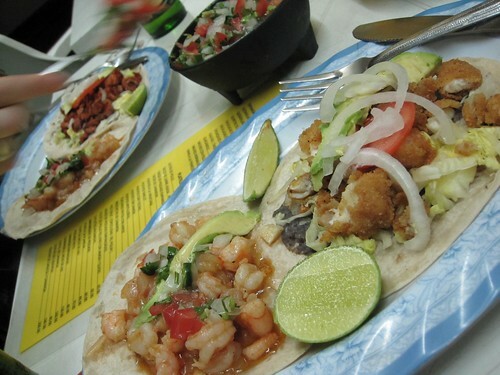 The crispy fried fish was served over a puree of spicy black beans on a bed of lettuce and was topped with raw onion, tomato, and slices of avocado. For dessert, the waitress recommended the caballero pobre, a Yucutan version of a moist bread pudding topped with sugar, cinnamon stick and raisins that we devoured about as fast as she could set it on the table. For a pair of travelers hungry for both a saner Cozumel and a more flavorful dinner than the cheeseburgers offered on the main strip, this was the exact place to be. All we had to do was step back. Go there: La Cabana del Piolin, if it still exists, is located on Avendia 15 between Calle 3 Sur and Calle 5 Sur. 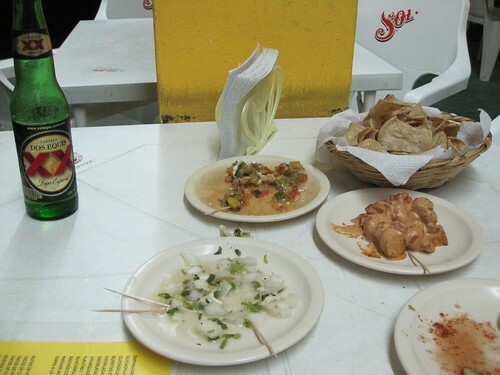 Tacos, beer, and dessert for two will set you back about 150 Pesos. 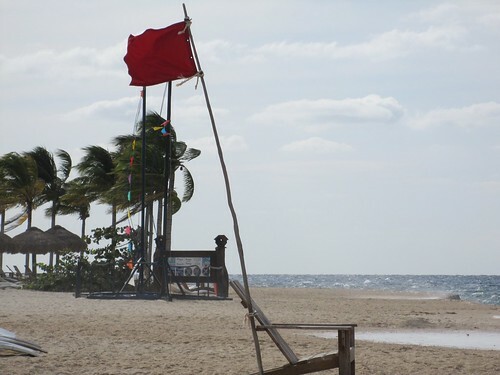 The wind in Cozumel puts a stop to everything. It wobbles the passengers on the top deck of the ferry and hitches the snorkeling boats to their docks for the day. It blows the fronds of palm trees straight backward and pitches blood red warning flags on every beach. On Cozumel, in the wind, there is nothing to do but sit and wait for the wind to stop. We try to sit on a beach. The proprietress of our hotel recommends Chankanaab, a snorkeling and beach club on the Western coast of the island. When we arrive, a man stands waiting in the large circular driveway holding a clip board. We stare, a little slack-jawed and uncomprehending, until we realize that this is the place in all the brochures: At Chankanaab, you can swim with dolphins. We tell him that no, we just want to sit on the beach. At Chankanaab, sitting on the beach costs $16. We pay, trying not to grumble too loudly, and enter the club. There are no real beaches on Cozumel—just a rocky strip of shoreline that drops off to the island’s famous coral reefs. We don’t realize this until after we’ve paid our $16, and have walked along the shore in desperation, searching for a patch of sand to lay ourselves down, crack open a book, and wait for the gale to stop. Instead, we sit on picky wooden lounge chairs arranged on a created strip of sand. The plastic sheeting underneath it pushes through in places like stubborn little bald spots. Hunks of bleached coral make walking a challenge. Finally, we huddle in our chairs under towels and shawls. I joke to Brea that I look like someone’s invalid old aunt who’s been wheeled out for the day to get some fresh air. She tries to read. I try to sleep. The wind pushes hard against our faces and backs. A blue-black bird takes off from his perch atop a grass-topped cabana and then careens sideways, landing right back where he started. He hoots and honks in angry protest, scratching with his feet. We don’t really enjoy it. We try to, but the wind is too angry, the beach too barren. Just downshore, a few brave tourists in wet suits brave the chilly air, and the dolphin pen. Were I a Cozumel dolphin, there are several other ways I’d like to spend my day than heaving tourists up and out of the water with my nose, their limbs flailing everywhere. The pen itself is depressing too—a square of concrete posts closed off with lengths of neon green netting. We are glad that we decided to forgo this particular attraction, even when we see a woman in a life preserver squeal with glee as her whole body rockets up above the surface with a great splash. We never see the dolphin, the thing that tossed her up there in the first place. He is hidden under the water where it’s warm, too busy with his work day and too occupied to preen. We give up. We don’t want to, but the wind becomes relentless, blows sand in every crevice of our faces, our beach bags. We walk back to the entrance past empty booths that promise snorkeling tours, past empty bars that promise tequila, past an empty restaurant where a single Chankanaab employee—a man in his sixties in a baseball cap—snoozes peacefully in a chair, waiting for something to happen—something other than the wind. Go there: Chankanaab National Park (It’s more like a resort.) 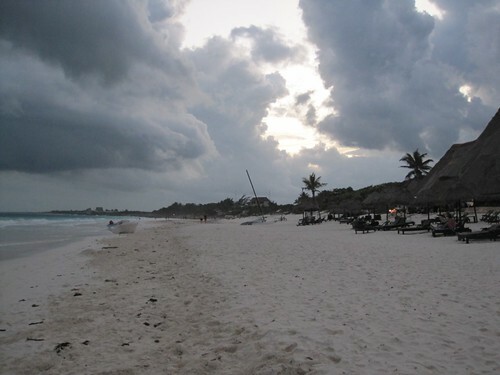 is located on Cozumel’s West coast, just south of San Miguel de Cozumel. Playa del Carmen is a carnival, a screaming strip of souvenir shops and bars with names in English. A Starbucks obliterates an entire corner, obstinate and white like a citadel. Shop owners hawk Italian lingerie, plastic watches, and t-shirts with printed slogans and lists like, “10 Reasons Why a Beer Is Better Than a Woman.” For us and Playa del Carmen, it is hate at first sight. We pour over our guidebooks for saving graces, for hidden gems among the bikini bars, but the one restaurant we’re dying to visit is shuttered and silent. We opt for a second that has a decent writeup, ascend the stairs to the second floor, and hope that the city will prove us wrong. Richard is dark-haired and gym-ready and symmetrically tattooed. He introduces himself, shakes our hands, as soon as we enter. “Where are you from?” asks Brea. He seats us at a table near the edge so we can watch the endless river of people move up and down Fifth Avenue below in a winding, unbroken stream. Blur’s “Woo Hoo Song” blares over a speaker. The minimalist decor—white walls and hard plastic chairs, a neon-lit bar—isn’t exactly promising, but makes it seem like someone tried, at least. Richard tells us that the restaurant has recently re-opened with a brand new menu, which explains why so little of what’s on it was mentioned in our guidebook. It’s a weird mix of sushi and other stuff—quesadillas, a pasta dish with shrimp, beef with a marsala wine sauce—that can’t seem to agree on which cuisine it is. We’re starving. Richard takes our order and steps back from the table. Later, when he brings our water, he asks us about the weather in New York (it’s January; it’s bad), and chats about the endless sun in California. When the food arrives, it is reflective of what was printed on the menu in only a ballpark sort of way, as though the chef was in a mood to improvise, or only got half of the day’s scheduled deliveries. The mushroom-and-chorizo quesadillas contain no chorizo. There is nary an onion in our beef-with-onions-and-potatoes. This is only the beginning. Odd flavors abound. The shrimp in the pasta dish is covered in balsamic and is hacked into tiny pieces, as though to disguise what it actually is. The beef is marinated in something garlic-y and sour and barely gives under our sawing knife blades. When we finally succeed in hacking through it, the whole thing separates and flops over: The chef has folded it in half, like a napkin. Later, we will discuss the purpose of this ad nauseum. Was the chef trying to make it look like a better cut of beef by making it into the shape of a better cut? Or is this an actual cooking technique? Or maybe one that he made up? We walk away dumbfounded and speechless. On the street, the ATMs will only give us American dollars and the rare ones that give Pesos charge exorbitant fees. We are exhausted and annoyed and fairly desperate for a drink, but we can’t muster the courage for any of the famous bars, the ones that play “Macarena” at full volume for half-drunk Australian teenagers and serve margaritas dyed a toxic-looking blue. 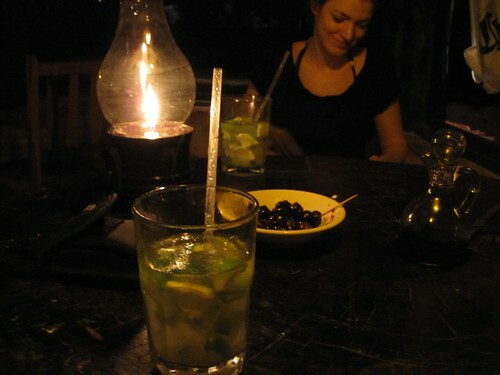 We opt instead for a tiny rooftop bar near our hotel that oozes music and laughter. We climb the stairs and what we see immediately thereafter confuses us so completely that it takes a moment for our eyes to adjust. Thirty or so people are seated in ragtag plastic chairs, all of them drinking and laughing. The youngest ones are in their mid-fifties. They are all wearing faded, boxy t-shirts and Teva sandals. The number of hugs and cheerful hand grips between them gives the impression that they all know each other. 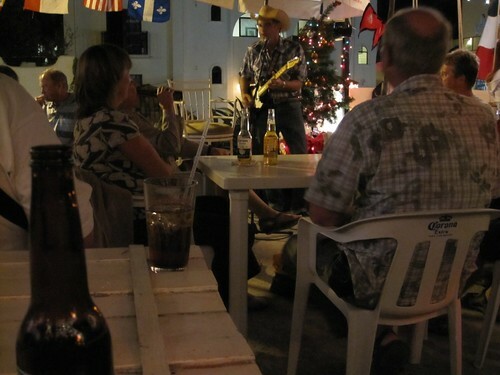 Standing in at the front beside a lopsided Christmas tree, holding court, is a man in his sixties wearing a blue flannel shirt, a straw cowboy hat, and a smart pair of Buddy Holly glasses. He’s playing a blues song on a gleaming yellow Fender, and he’s really good. I buy a round of Pacificos at the bar (20 pesos each) and we snag two open spots at a picnic table. This is when I spot the beer coozie. It is sitting in front of, and presumably owned by, a gray-haired guy in a t-shirt that says Go Fishing or Die. And it is adorned with a maple leaf. Brea, almost simultaneously, spots another man in a maple leaf t-shirt. We look at each other in the same instant, eyes widening: These are not Americans. These are Canadians. We have apparently stumbled upon an ex-pat bar, or a bar in which Canadian ex-pat night is well and truly underway. The accents around us suddenly become all too telling, all those flat vowels floating past. A roundish woman named Linda makes a request and then joins the guy in the glasses up front to sing along, but she only knows one line of the song. “The call her One-Line Linda,” he says into the microphone. “I’ve heard her called worse!” shouts a man who had been sitting next to Linda at her table. Later, we’re instructed to sing Happy Birthday to a pretty blond sitting near us. She’s surrounded on all sides by hopeful-looking guys in polos. Her name is Leslie. Brea goes up to the bar to buy Leslie a glass of wine for her birthday, and I lean across the table. “Excuse me, sir,” I shout over the din at the guy sitting across from me. He’s wearing a Minnesota Vikings t-shirt and has a bristly walrus mustache. “What’s that guy’s name?” I point at the guy with the guitar. “We wanted a beer,” I say. “These folks are mostly from Canada but a lot of people from Minnesota hang out here, too,” he says, waving at the assembled crowd. Leslie pops up out of her seat and throws her arms around both of us. She kisses me on the cheek. Exhausted, we head for the door, but not before we find a Playa del Carmen that we can live with—the realest or the most unreal, either or both. The new decade arrives while I am sitting in the front seat of a van stuffed with eight people. An hour before at the airport, the ride is sold to us as a “private, direct taxi ” until we are told, with only feigning and half-smiling regret by a guy with a walkie-talkie, that there are “no more drivers.” We’ve already paid. It’s nearly midnight. We are cotton-headed from the flight and in Mexico, in the muggy holiday dark, there are no other choices. Cancun in the dark is a square strip mall filled with lumpy ghosts of stucco and concrete, and dotted with the neon of 7 Eleven signs and hung with strings of colored lights. We sit up front with the driver while the German and Californian tourists in the back seat talk about Manchester United. The driver talks to us. He points out the window at things we might want to see—an enormous open-air church, a guy in a car next to us weaving perilously between the lanes. Bon Jovi’s “It’s My Life” blasts on the radio. We stop to drop off the Californian tourists at their hotel—a lumbering tower of yellow-painted cement near a highway underpass, and then to drop off the Germans at another. At midnight in the heat, the Christmas garland around the hotel entrance looks disingenuous, as though the proprietors have simply left it up too long. We are the only ones in the van when the driver points to the horizon, to shimmering little clouds of fireworks puffing silently in the distance. Brea digs around in her bag and pulls out her phone, pressing a button. The LCD illuminates her smile in the dark. The instant comes and goes, but my eyes stay on the fireworks. They are the kind that explode into soft, round chrysanthemums of gold and orange, that twinkle and hang for a few seconds before they disappear. They appear one after the other in a silent bouquet. We are much too far to hear the noise, and the music drowns it out anyway. The driver sighs and points to the clock on the dashboard. “My family,” he says. We’re all ready to go home, then. Just before we arrive at our hotel, a collection of whitewashed bungalows hemmed in by walls of bamboo, I see fireworks in another direction. The are thin and low to the ground, and instead of bursting into grand circles of light, they streak across the sky like fast-moving little comets, and in only three colors: red, white, and green. 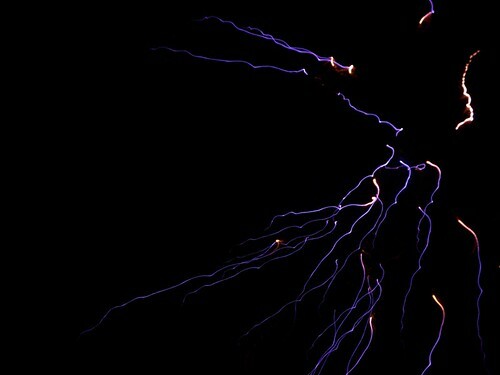 It is better than any party, any shouting celebration—these tiny lights in the dark. Go there: Cancun is located on Mexico’s Yucatan Peninsula.